Cover letter example for a Buyer position in retail. Amend as suitable and start writing your own covering letter to apply for job vacancies. I should like to apply for the Buyer’s role, as advertised recently. I would like to take up a role where I can be given the opportunity to present new ideas to senior management teams, write reports and help to interpret sales forecasts. In my current job I select products, source suppliers and negotiate prices. I spend quite a lot of time researching on the Internet, and use catalogues and trade directories to see what our competitors are developing. I spend the majority of my time analysing consumer buying patterns and monitoring and control stock, including ensuring deliveries have arrived and paying suppliers. I enjoy interpreting statistics and using that information to make informed commercial decisions. I enjoy negotiating with suppliers, dealing with people and working hard to achieve targets set. I am educated to Degree level (business and management) and have a CIPS (Chartered Institute of Purchasing and Supply) Certificate in Purchasing and Supply and recently obtained a CIPS certificate In Professional Management. I would now like to move into a role where I can work closely alongside marketing and sales to help develop the product ranges and expand the sales territories and be more actively involved in strategic decisions affecting the future development of product lines and ranges. I am available for interview at your convenience and references are available on request. I attach my CV and look forward to hearing from you as appropriate. 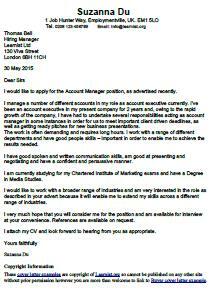 View more cover letter examples!